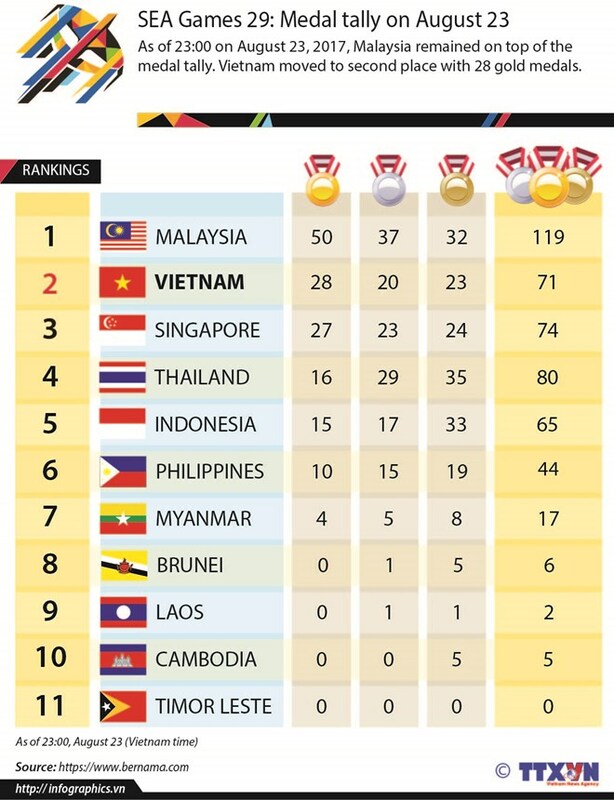 Kuala Lumpur (VNA) – Vietnam advanced to second place in the medal tally of the ongoing 29th Southeast Asian (SEA) Games in Malaysia at the end of August 23, the fourth official competition day. The spot was earned after Vietnam won 12 gold medals during the day, twice the expected figure. The gold medals were in gymnastics, fencing, karate and athletics, bringing its total gold to 28. The country also pocketed a total 20 silver and 23 bronze medals. The same day, Vietnam women’s and men’s volleyball teams both secured their win against host Malaysia and Timor Leste, respectively. Malaysia remained on top of the tally with 50 gold, 37 silver and 32 bronze medals.